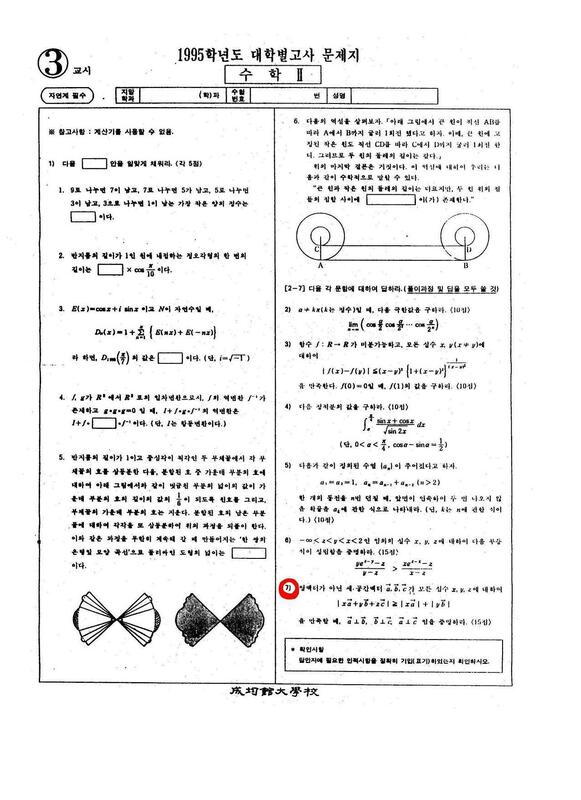 The saga of a Korean mathematics professor, who says he was dismissed after pointing out a mistake made by his superiors, is causing a minor furor in mathematics circles worldwide. Kim pointed out--correctly, mathematicians say--that no three nonzero vectors satisfying the hypothesis exist, and proposed that the question be disregarded in scoring the exam. No changes were made; instead, Kim was denied a promotion and let go in February 1996. University officials say Kim didn't meet promotion requirements. Kim, claiming his dismissal was retaliation, sued. 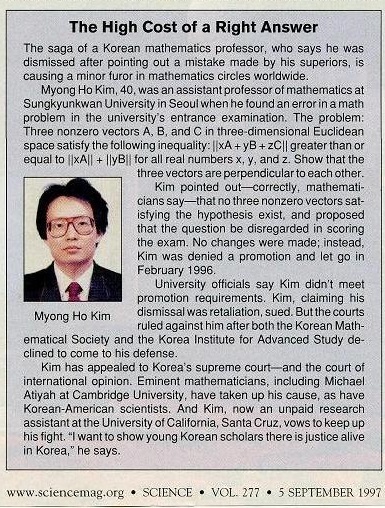 But the courts ruled against him after both the Korean Mathematical Society and the Korea Institute for Advanced Study declined to come to his defense. Kim has appealed to Korea's supreme court--and the court of international opinion. Eminent mathematicians, including Michael Atiyah at Cambridge University, have taken up his cause, as have Korean-American scientists. And Kim, now an unpaid research assistant at the University of California, Santa Cruz, vows to keep up his fight. "I want to show young Korean scholars there is justice alive in Korea," he says. The movie, 'Unbowed' is made. See below.